Normally I'm all for repurposing items but this one is ridiculous. 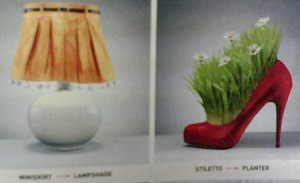 Mini skirts are flammable and stilletos lack drainage! A 43 year old Japanese woman was arrested for "murdering" her 33 year old "husband" in an online game after he divorced her without warning. (She hacked into his account to do the deed, police said.) That'll teach him not to mess with an avatar in virtual perimenopause. Three women have filed a $1 million lawsuit against the male-oriented cable network G4 for allegedly filming then at a club without their consent for a segment called The Great Cougar Hunt. Cable dudes, be more careful. If we're old enough to be called cougars, we're old enough to hire really good lawyers.